Our new email server is both an incoming and outgoing email server. If you have an email account with us, you can send mail using the server mail.lmi.net. 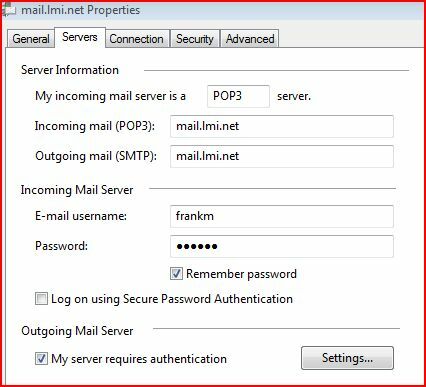 If you are not on the LMi network, then you must turn on password authentication for the outgoing (SMTP) mail server in your email clientsoftware. Use the same login name and password as you do for your incoming email. Note that many ISPs will block outgoing connections to the standard SMTP port 25. This is done to combat spam. If you find you are unable to connect to our outgoing mail server, you can change the port number to 2525. Here are instructions for setting up an Authenticated SMTP server in various popular email clients. 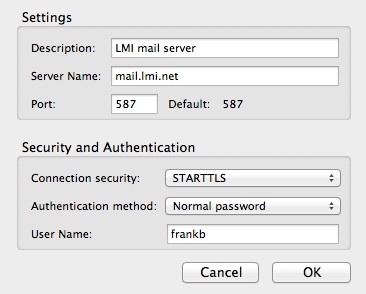 If you are already using “mail.lmi.net” as your outgoing server, you can just edit the setting for it. Otherwise, click “Add..” to create a new one. Click the “+” button to add a new SMTP account. Select “Password” from the Authentication pull-down menu, and enter your email login and password. On a Mac, select “Settings…” from the Special menu. Under Windows, select “Options” from the Tools menu. Click the “Sending Mail” icon from the column on the left side. Eudora will automatically use the same login and password as is set for the incoming mail. Select “Accounts…” from the Tools menu. Click the “Settings…” button. On the next screen, verify that “Use same settings as my incoming mail server” is checked. Click OK to save change, and you are done!